Join the glitter tattoo craze with our spring themed Easter Glitter Tattoo Kit! 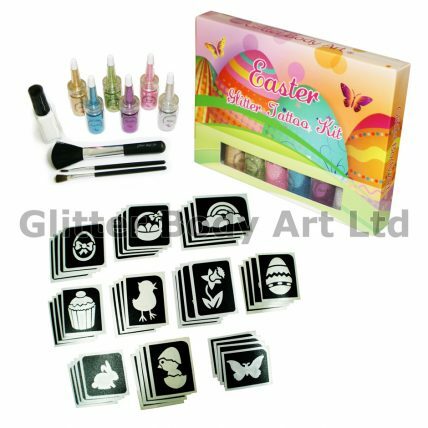 With 40 unique eye-catching easter themed temporary tattoo designs and 6 sparkly body glitter colours to choose from, you can create fantastic multi-coloured tattoos. Be artistic and create your own fantastic tattoos by using different colour combinations to create the ultimate temporary tattoo that can last up to seven days. One 5ml Body safe adhesive, Hypoallergenic, Safe for Over 3 but recommend patch test if sensitivity. Application Brushes (one small brush for applying various colours or cover small areas, one medium for applying one colours and a duster brush for removing any excess glitter). Glitter Tattoo Stencils x 40 (pictured). There are six Body Glitter Colours (5 gram puffer bottles which have a rubber removable lid for easy refilling). Stencils are three layers and easy to apply. There may be a variation of Stencils and Glitter Colours. Customers may buy additional stencil designs and glitters through our website. Tattoo may last up to 7 days if cared for properly. The tattoos are waterproof, however, prevent from rubbing when damp. Tattoos may be removed from the skin with baby oil.